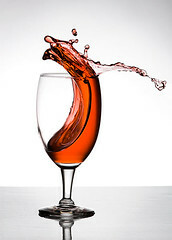 This was shot using a single flash aimed at a white background behind and below the glass. The wine glass was fastened (double sided tape) to a moving platform which was pushed up against a stop. Du liest "A Splash of Red", eingestellt am 17. März 2007, zuletzt geändert am 28. November 2008, abgelegt unter Flickr.